Today's post is not specifically about food. It is more generally about life. At the beginning of summer (4 months ago) I walked around my university campus with camera in tow. I thought it was time to photographically capture the beautiful, minimalist shapes and colours of the area. A lot of students say that our campus is dreary and depressing; but I think it's inspiring and the perfect blank canvas for academic and personal creativity. I couldn't have designed it more elegantly myself. The architect was fellow Canadian Arthur Erickson, a favourite of mine. In all his projects it seems to me that he saw the intricate design lines in nature and recreated them as simply as possible, constructing humble yet mesmerizing functional forms where you, your work, and nature were the real focus. I could talk about his architecture forever though. Moving on. I adore the aesthetic contrasts on my campus. The buildings are cold, concrete, grey, geometrical slabs with large glass windows showing themselves every now and them. But all that greyness lives so well in harmony with all the green! 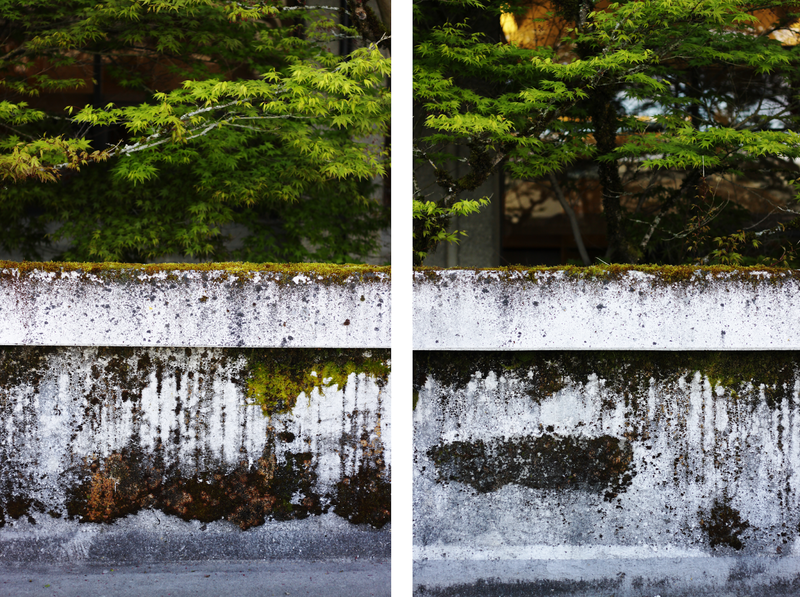 Moss abounds, blossoming trees grow out of seemingly dead cement blocks, and the campus itself is on the top of a mountain, thus surrounded by forests, rivers, and other mountains. The bleak buildings are the frame of vibrant life! This is why I love minimalist design, it provides a surface for you to evolve. I want the spaces I inhabit to be as simple and functional as possible; they don't need to be fancy or try to mimic nature. Nothing human-made can successfully mimic real flowers, fruit, forests or anything else one finds in the wilderness. This is also why I don't usually wear bright colours; I leave it to nature to show us how to do that. I also love how life is able to spring up from anywhere and everywhere. I smile when I see weeds sprouting up from the cracks in sidewalks, and when I spot trees growing out of rock faces. It's the perseverance of plants that so often inspires me. And on that same train of thought I wonder why we have consistently tried so hard to crush all these rebellious seeds. I hope one day the human species will realize working WITH wilderness is incomparably more productive than working against it. We are not separate from nature; we ARE nature. It's all connected. We are all one. I am not even speaking from a personal perspective; it's fact! Our entire planet and all that came from it (including us) previously was derived from other stars that had died out and exploded into the 13.8 billion year old universe we breathe in. There is no such reality as humans vs. nature because it's all simply nature. Perhaps if we learn to see ourselves as a component of this global ecosystem instead of the dominators of it, we can finally look at one another and see each other as brothers and sisters instead of enemies. We can celebrate differences instead of fighting them. We can nurture environmental, personal and mental health instead of destroying and drugging it. Basically put: when we realize we're all one, we can finally grow up. Humans are wonderfully unique in how intellectually evolved our brains are, and yet at this point most of the net cranial energy seems to be directed at short term money making and social control. Of course it's needless to say that there are millions of people working hard to create the world I have been describing, but they are all in minority groups. I firmly believe - and must believe - that in a sense we are still in the Dark Ages of human development; we are in our species' infancy. I'd like to think that one day in the future, children in school will study our time and be shocked by the irrationality of so much we consider normal; war, poverty, lifestyle diseases, racism, sexism, ageism, ableism, religious oppression, government and corporate corruption, imperialism, and more. Call me a naive vegan hippie (although I'd rather you didn't) but my logic is: we're headed for Utopia or bust. An unhappy and unhealthy global population cannot be sustained. It's that simple. It will take a long time and seemingly endless struggle for the rights of ALL OF US to finally be weighted equally, but we will get there as long as we don't kill the planet before that point (unfortunately that is a very high possibility). I understand that it's human nature to be selfish and greedy, but there are definitely ways those traits can be utilized in positive avenues. Instead of Walmart being rich from slave labour and GMO's, it can easily be just as wealthy from locally made clothing lines and organic plant-based foods. If you think that sounds unrealistic, take a step back 100 years ago to when - in colonial European culture - people with darker skin were believed to be biologically inferior to their lighter skinned counterparts. Of course a huge percentage of the world is still dealing with intense racism on a daily basis. I am not saying by any means ethnic prejudice is a thing of the past. I am merely saying that our moral evolution does seem to be going in the right direction, albeit slowly. My point is: things change. Things improve. The powers that be don't let revolution happen easily but when the public wants something bad enough, they will get it. My partner has fallen asleep because I told him to leave me alone while I finished writing this, so it's time for me to clock out and dive into bed for a good spooning session. Just know that I don't mean to offend with these words. These are my opinions that have been developed because of my own experiences in life. I hope you can find inspiration in my thoughts, and imagine the possibility of a future where human life is seen as part of - and equal to - all life. Emily - I loved reading this post. Your thoughts very much match my own. "Perhaps if we learn to see ourselves as a component of this global ecosystem instead of the dominators of it, we can finally look at one another and see each other as brothers and sisters instead of enemies" - just awesome. I loved this post and these were very inspiring photographs. whatevs!! that campus is BEAUTIFUL!!! wow. love your photos. what a stunning place. enjoy FALL! it is so stunning. I guess I am a cynic, but I don't see it happening. I think the planet will be destroyed long before all humans can get along. Which, of course, is not to say they're/we're all bad..."the few ruin it for the many"...so best bet is to seek out kindred spirits and hang on to them once you find them. This is such a beautiful post. Although I love seeing new smoothie recipes and delicious desserts, I find the posts you submit regarding your world views and hopes for the future to be your finest. We humans have been on this brilliant planet for such a small amount of time it seems ridiculous to put ourselves above all else. I too have hope that one day children will grow up in a world where they are taught to be conscious of the world around them. Conscious of who assembled their clothing and toys, conscious of the origin of the food on their table, and conscious of the mark we each leave on this planet that thrived without our presence for billions of years. I hope one day feelings of empathy will prevail. It's so nice to see that other people in the world have the same kind of views as my own. Sometimes it feels as though your all alone in your dreams for a brighter future. Thank you for sharing, I appreciate it. What a nice surprise this post was! I have my Ecocriticism students spend time outside the classroom on our campus. These spaces have to be seen and incorporated into our thoughts and experiences. I love this post. Thank you! Here's to a better future! Your third paragraph is brilliant. So well said. Some friends call me pathologically optimistic but I, too, think that humanity is beautiful and absolutely capable of evolving into a more enlightened, loving, peaceful and happy state. There is so much hate and disdain around, it often makes us sound naive, but my faith (and yours) are based on experiences, watching people evolve, wake up individually. We ARE capable of change. And more and more people understand. It's just, like you say, that it will take time. Do you have an app yet? Wonderful post. The photos are absolutely beautiful! Have you ever read "The Ones Who Walk Away from Omelas"? I'll link it below in case you haven't and if you're interested. I read it in my required English Comp class and it became one of my favorite short stories that I've ever read. It's harsh, thought provoking, and splendidly written. It's basically about a utopia, but the price that must be paid to get there. We can never have a world free of pain. But we can take on the pain as individuals, instead of asking others (animals, people across the globe, etc.) to take our pain so that we may be happy. Anyway, here's the link. All that stuff I just said makes a little more sense if you know the story. The pdf is the first search result. 1) Your photos are beautiful and I have to agree that you accomplished capturing naturing engulfing man made structures. Their great! 2) I am with you that there is hope for change. I've been really into history lately and something are crazy from the past. Like I was reading a pamphlet that was against women voting. It ended with one last reason to not let women vote which was pretty much "Do you really want a WOMAN to be able to vote?!" I recently heard a politician talking about the immigration crisis in the US (which is pretty much unaccompanied minors sneaking in the US asking for sanctions) When asked about what the harm was for having their kids coming in there were lots of bs answers, but concluded with "These kids are going to be able to vote one day! We need to think about that" I had felt a chill down my spine. It's really refreshing to see someone in my age bracket confident enough to voice their opinions online. We all speak from opinion which is derived from personal experiences. My own experiences dictate to me this: It doesn't hurt to be a good person. Nobody loses out when they choose to be a better human being, both to others and to the world. It's easy to be destructive and greedy, but it's not too tricky to be a decent individual, either. In fact, with the right frame of mind, it's easier. Now if people just considered that for one second, it's worth preaching a thousand times over. WEll said, Inspiring and wise words from someone so young. I am a lot older and more cynical although I still have hope in my heart that we will evolve as more compassionate beings before we destroy our beautiful planet.